We’ll gather in Room 1D of the Legislative Office Building at 10:00 for briefings on issues and an outline of plans for the day. Flyer here. Facebook event here. RSVP/more information: Jane McNichol, jmcnichol@universalhealthct.org; 203-427-3909 or here. The race is on to offer Connecticut small businesses and individuals new quality health insurance coverage they can afford. Will you help us get over the finish line? 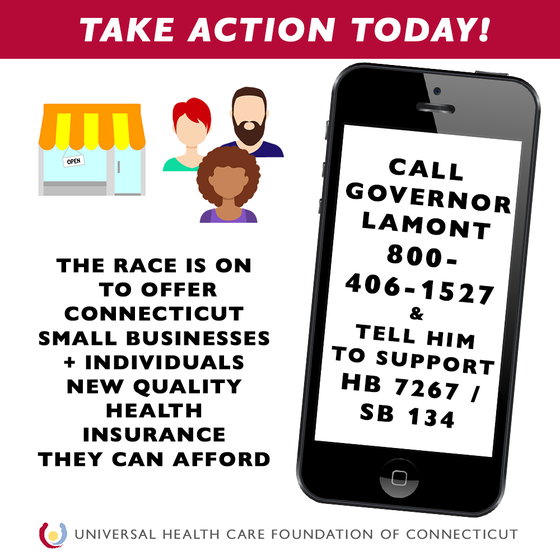 Call Governor Lamont at 800-406-1527 and let him know that you need him to support small businesses and individuals seeking better health insurance choices. Ask him to support House Bill 7267 / SB 134. Make the call now! Groundbreaking legislation to open up new health insurance choices, built upon the health coverage state employees and legislators receive, could pass in the next six weeks. Small businesses are the major source of job growth in our state, employing over 700,000 people. They struggle to afford health coverage for their workers, facing double digit increases year after year. They deserve better options for their employees, not health plans that only pay for care after people spend thousands of dollars on co-pays and deductibles. Individuals who buy insurance on their own have fewer and worse insurance choices. The high deductibles they face are a barrier to using their coverage to address worrying symptoms or help them stay healthy. A new insurance choice built upon the state plan, sometimes called a “public option,” would mean small businesses and individuals could benefit from the negotiating power of the largest health plan in the state.